A referee picks up a flag during the first half of an NFL preseason football game between the Baltimore Ravens and the Detroit Lions in Baltimore, Friday, Aug. 17, 2012. Every offseason, NFL officials make an instructional video that highlights new rules and gives players a warning about which existing ones will be called more tightly in the upcoming season. This year, officials say they’re going to key in on defensive holding and illegal contact, ensuring they’re called correctly. According to reporting by ESPN’s Jeffri Chadiha, officials became concerned that those particular penalties were not being called as often as they were a decade ago. (Conspiracy theorists, on the other hand, blamed the Seattle Seahawks’ dominant defensive performance against Peyton Manning’s record-setting Denver Broncos offense in the Super Bowl.) With an assist from the data of Pro-Football-Reference.com, we wondered if the official rationale holds up: Have illegal contact and defensive holding really been called less (on a per-pass basis) in recent seasons? In the case of illegal contact, yes. In 2004, Indianapolis Colts general manager Bill Polian spent the offseason lobbying the NFL Competition Committee to more strictly enforce the illegal contact rule in the wake of his team’s 24-14 playoff defeat against the New England Patriots (a game in which Manning — then playing for Indianapolis — tossed four interceptions). As the chart below shows, referees began calling the penalty much more often the very next season, a 15-year high point. 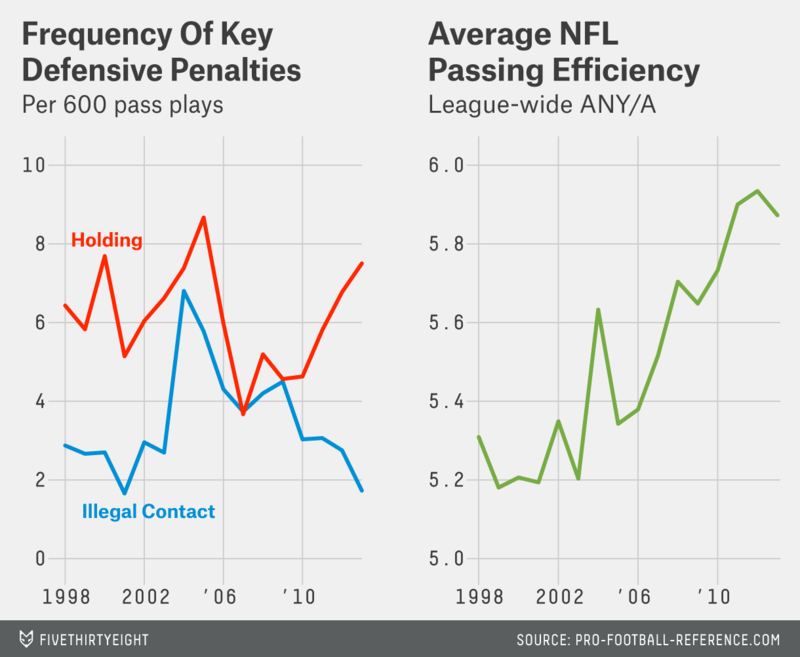 Since then, the penalty’s frequency has steadily receded. However, the pattern is less obvious with defensive holding, which also peaked around the middle of the decade but reversed its decline by 2010, and was near its 15-year high just last season. It doesn’t seem to be a penalty in need of greater emphasis. Then again, concerns about the wisdom of placing more restrictions on defenders in an already pass-happy league may be largely academic. At least in terms of illegal contact and defensive holding, there doesn’t seem to be any relationship between the frequency of either penalty being called and the NFL’s overall level of passing efficiency (as measured by Adjusted Net Yards Per Attempt). The last time the NFL cracked down on holding and contact by defenders, it didn’t make any noticeable dent in the rising trend of passing efficiency. Pass offenses have steadily become more and more efficient over the last decade and a half — but that’s part of a longterm trend of increased passing efficacy, not because of the rule changes inspired by Polian a decade ago. The same will likely be true for the changes made this offseason as well.